Knead by machine or hand, or leave it alone and let the yeast take care of the hard work for you. Anything goes. Bubbling with enthusiasm from my recent success, I threw myself at a whole-grain and rye sourdough bread. I slapped and folded, and almost crashed and burned. Depending on your baking guru, you can either knead or not knead dough in many different ways and still bake excellent bread. Try Richard Bertinet’s slap and fold (jump to 4 minute mark in this clip, but it’s well worth seeing it all) or Tartine Bakery’s Chad Robertson’s stretch and fold (2 minutes in). Dan Lepard’s in-between technique with short bursts of kneading intersperced by periods of resting also works fine for me. 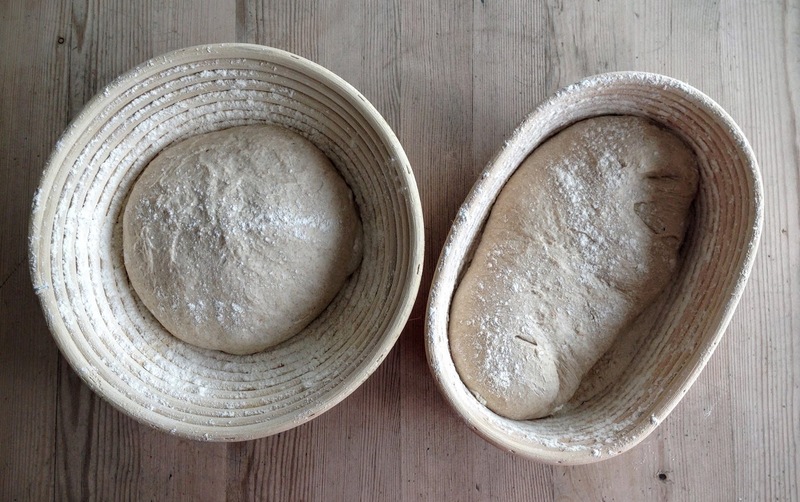 The last couple of years, the no-knead method has made it even easier. Much of my bread is made this way. To be honest, it doesn’t really matter what you do, it’s a personal preference thing. You’ll still make excellent bread. Moving on, today’s loaves turned out ok, even though the dough felt a bit lifeless. Oven spring was not impressive, the crumb a bit tighter than I would have preferred. Something to do with temperature? Perhaps I’m battling a culture with a mind of its own? Most likely, my sourdough starter wasn’t as alive as I thought and I was impatient. Good news was they came out good enough to eat with a nice, thick layer of butter. They were quite nice toasted too. A tighter crumb than I would have liked, but the taste was nice. Compared to the 10% whole grain in yesterdays bake, today I’ve upped it to 20%, with whole grain wheat at 15% and rye for the last 5%. Autolyse lasted two hours, which I can see other bakers are having great success with, both with regard to the size and texture of the final loaf. Today I wasn’t as fortunate. Autolysis is what happens when you mix flour and water together and leave it for 15 minutes to 2 hours before adding preferment/sourdough and salt. During this period the flour absorbs the water, breaks down proteins (glutenin and gliadin) and helps align new gluten strands, creating a more flexible dough, which when baked results in larger bread with better crumb structure. I usually mix in the preferment too, so the only thing missing is salt. I haven’t experienced significant differences in the end result. Why two hours? Amazing things can happen, which you can see at Discovering Sourdough. These loaves are about 73% hydration, which is relatively sticky. 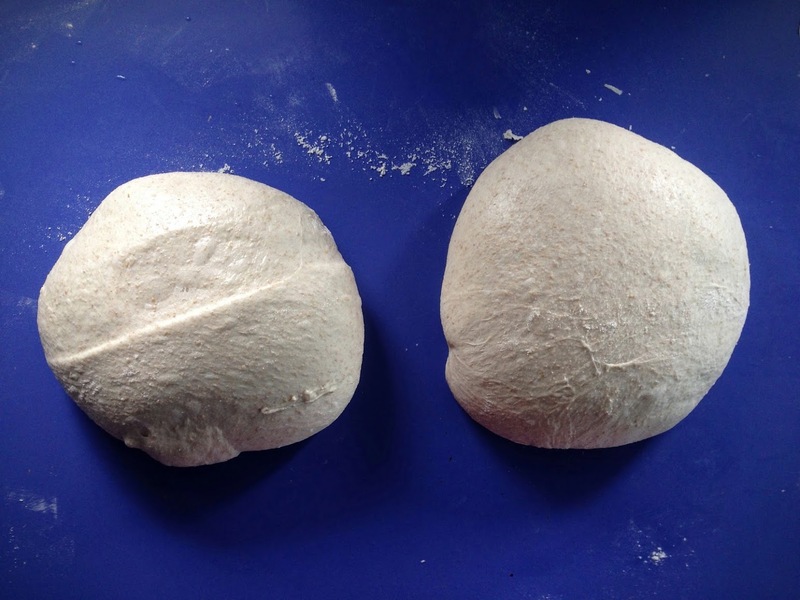 It takes time and practise to learn how to handle wet doughs, but it’s well worth the effort. There’s nothing wrong with keeping back 50 ml water to make handling easier. The bread will still be excellent. After two hours’ autolyse the dough is elastic, even after the salt has been added. After scaling, let the dough rest on the table for 5-10 minutes. 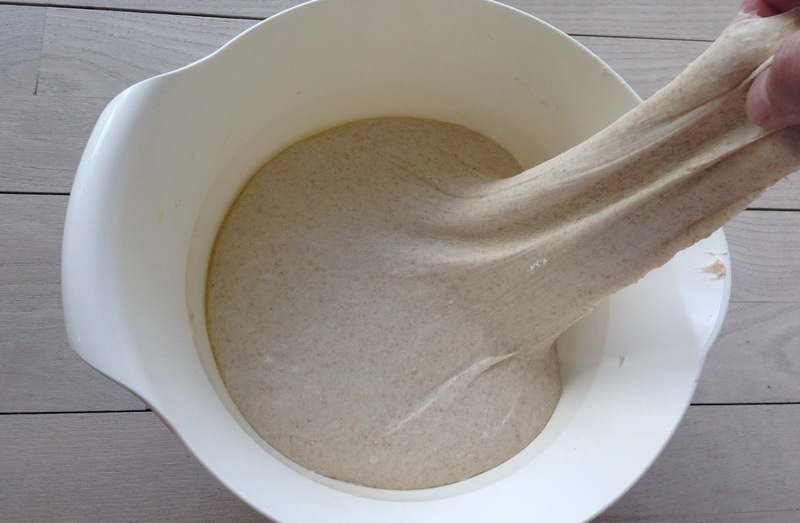 This allows the gluten to relax, which makes it easier to shape the final loaf. 3-5 hours proofing depending on temperature ahead. Loaves weigh in at about 975 g each. The lazy baker strikes back. Mix, cool and bake the next morning. peter on The lazy baker strikes back. Mix, cool and bake the next morning. Sabine Mueller on The lazy baker strikes back. Mix, cool and bake the next morning. I'm not a pro. Just an enthusiastic amateur with a passion for bread. Follow my successes and failures as I try to bake the perfect loaf.